Lorna Pillow is responsible for strategy, insurance and operations at London Forfaiting Co. Ltd. (“LFC”). Lorna’s expertise within LFC is on structuring transactions ensuring added value to clients, investor relations, minimisation of risk as well as working with the individual regional offices on business development. 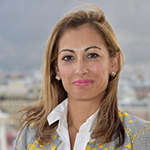 Her focus is to ensure that LFC continues to play a meaningful role within Global Trade Finance and Forfaiting. Her career commenced with the setting up of Trusts for an international company and subsequently she was involved in trading international Repos and Securities Lending on behalf of RZB Vienna through an agency company. Her progression ultimately led to Lorna being appointed the General Manager. Under Lorna’s supervision the LFC Operations Unit was successful in attaining the first ever ISO9001:2000 certification in Forfaiting. During her tenure her role expanded to encompass the establishment and management of the Factoring Department for FIMBank plc. Lorna is an honours graduate in Banking and Finance. She currently sits on the board of the International Trade and Forfaiting Association (ITFA), as Deputy Chairperson responsible for Communications and Membership. Lorna can also be contacted on info@itfa.org.